If you would prefer to give a small cash donation, this will enable us to purchase fresh milk, bread, cheese and eggs and to buy fresh vegetables / fruit vouchers to include with individual food parcels. 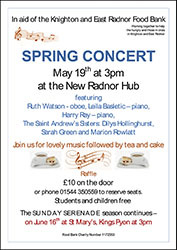 Join us for lovely music followed by tea and cake at the New Radnor Hub, on May 19th at 3pm. 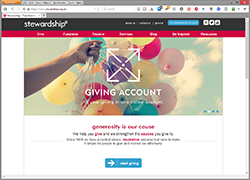 To open a Giving Account to support the food bank through Stewardship please download the forms from our Support Us page. 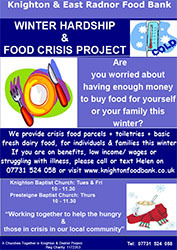 Are you worried about having enough money to buy food for yourself or your family this winter? We provide crisis food parcels, toiletries and basic fresh dairy food, for individuals and families this winter. If you are on benefits, low income/ wages or struggling with illness, please call or text Helen on 07731 524 058. If you would like to volunteer to help us at Knighton Food Bank, or you’d like to make a donation of either food or cash, please contact Helen for more information. See the list on the right for Help, Guidance and Referral Agencies.